Increased Control – Control heating and cooling comfort where you want it, when you want it. How does Zoned Air Conditioning Systems Work? Zone controlled systems divide a home into areas with common heating and cooling needs. Airflow is controlled in each area by a separate thermostat. Then, instead of sending the same amount of heated or cooled air into all room every time the furnace or air conditioner is turned on, the system sends conditioned air only to the zones that need it. 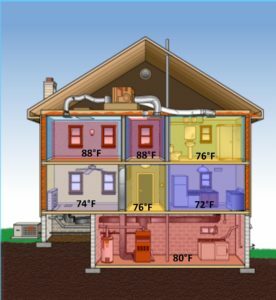 With zoning, you can cool or heat one area of the house at a time.